Starting your garden from seeds is a great way to save money, grow interesting varieties you can’t find in the nursery, and can be a rewarding experience. When just starting out, gardeners tend to learn by trial and error. In fact much of gardening is figured out that way because everyone has different soil, light, and weather conditions. So one thing might work great for one gardener and it might not work so well with the next. That being said, there are a few things that can be universal to most gardens. Today I want to talk about what seeds do better when started directly outdoors vs starting inside in a pot. Corn- top of the list. Partially because they are so easy to start out doors, and grow so quickly that why bother starting and transplanting? But also those big seeds don’t like to be transplanted and will more likely get transplant shock and possibly die when transplanted. Rather to get a head start on them, I soak and then sprout them just slightly before planting them. This gives them a better chance of growing. Soak for a day or so or until they no longer look shriveled up. Then sprout them in a sprout-er, or covered with a damp paper towel. Making sure to moisten them about twice a day. Extra tip: try growing pop corn- So fun!! Peas and Beans. Also being such big seeds they just don’t do well when transplanted. I use the same method of sprouting before planting directly outdoors. 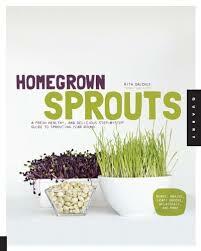 It speeds up their growth and you also know which seeds are duds and which ones not to plant by sprouting. Plant right after they start to open up- don’t wait too long. Its a good idea to have the garden bed where they are going to be planted ready before hand so that you are not scrambling to get it ready when the seeds are. Carrots, radishes, onions, beets- actually lets group all root veggies in here. Root veggies grow mostly a big tap root and very little side roots, thus the soil around them will not be held together much when planting, thus makes it hard to transplant. Onions do ok if they are transplanted very young as they act a little bit like a grass right at first. But they grow so well just directly planted even in early spring, that I don’t bother planting indoors. 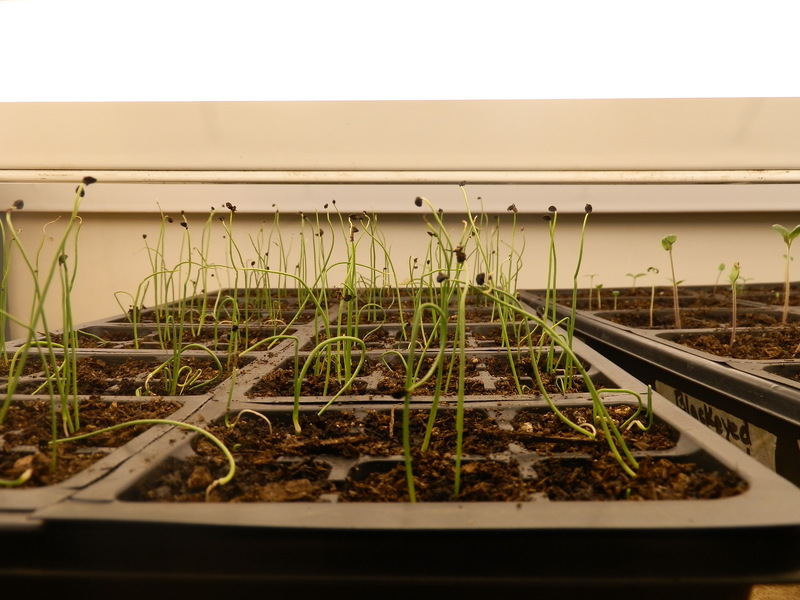 You can ever through some onion seeds out in the fall and as soon as the conditions are right, the onions will just start growing themselves. Its fun when you see little baby onions poking up through the snow! Squash family plants. This one is a little bit tricky. In our area, it actually is best to start them indoors, and CAREFULLY transplant being sure not to disturb the roots. But the key to this is not to start them too early. Generally 2-3 weeks before the last frost. Then plant outdoors after the last frost. You want them very small and immature when planting outdoors or else they will directly die or get transplant shock so bad it stunts their growth. They like it warm, so putting them in a wall of water or a hot cap over the top of them might help speed up their growth. They do well when directly sown outdoors, just need to make sure the soil temperature is warm enough for them. One of the things we have to watch out for in our garden, is those tender, tasty little plants get gobbled up in one bite by snails and slugs. The whole plant disappears! So be sure to bait or prevent snails from eating your little plant before it even has a chance. There you go! Now I only know all this because I learned from my experience. So if you have found that something works for you, PLEASE share, it might help someone out there! Happy Gardening! With spring just around the corner – well, it’s here in some states – I thought it would be a perfect time to share some simple tips for gardening, what to start with, how to manage it and what works best for beginners. 1. Now is the time to start tomato, pepper, and eggplant from seed. 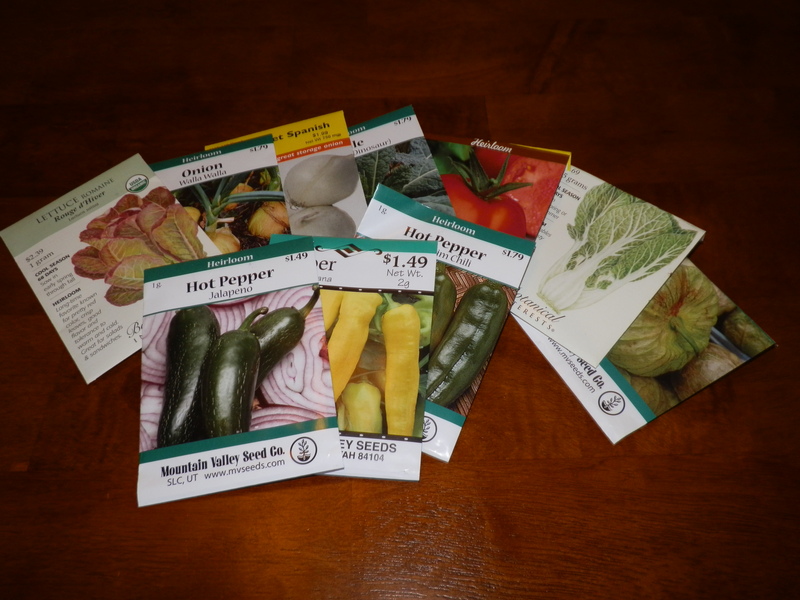 You’ll have more choice of plant varieties by choosing your own seed. Some varieties will thrive better in your micro-climate. 2. Check with local Master Gardeners or County Extension for specific suggestions. 3. 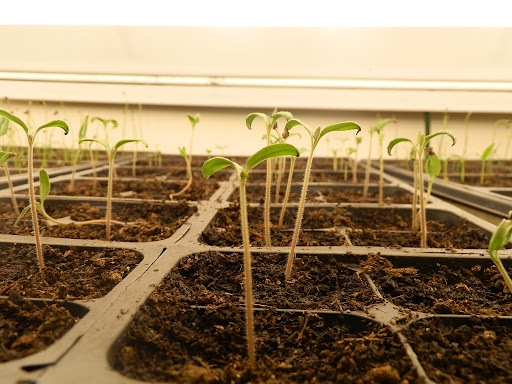 Tomato, Pepper, and eggplant respond best if gentle bottom heat is provided for the 1-2 week period necessary for germination. 4. After the 1st set of true leaves appear, transfer plant into individual peat pots. 5. Transfer plants only after “hardening off” (gradually exposing plants to sunlight, wind, etc). I wait until soil temps are at least 50 degrees F. Remember, tomatoes respond best to full sun! When you plant your garden, the most cost effective way to grow it is to plant seeds instead of buying every single plant start. This is especially true when going things like onions, carrots and lettuces. They only produce one plant from the seed, so each carrot seed produces one carrot. So if you by an onion already started, the cost might end up being more than buying a bag of carrots from the store! Starting your own seeds is also easy. It might take a few tries to get it to work for you, but I’m sure if you make sure you are giving the plant what it needs, it will grow for you. First step is to make sure the soil where you are planting has lots of great organic matter added to it, and is nice and loose. This is particularly true for carrots and other root plants. They cannot grow downward in very compacted soil. Soak the seeds for a little while. This could be 30 min to an hour. Just put the seeds in a little bowl and pour in some water. This gets the seeds activated. Its like pushing a start button. Tells them, ” There is water, you can start growing!” A seed needs first- water, then sunlight and soil. Plant the seeds in the garden, making sure to follow the right depth for the seed. Some very small seeds need only a skiff of soil to cover them. The smaller the seed, the less soil they need, the larger seeds like peas and beans, need more soil to cover them up. Keep them moist. They do not need to be soaking wet all the time, but do not let the soil dry out too much as this will draw the moisture stored inside the seed out and kill the seed. But the seed will also not grow if it is too wet. The seed and plant roots in general need access to some air in the soil. So being too wet, makes it hard to get that air. This is why looser soil grows better plants- they have more oxygen and room for the roots to push through the soil. Label the plants. There is nothing worse than forgetting to label your plants and have a totally different plant grow in a spot you thought you had planted something. This especially helps if you have different varieties for the same plant, such as a few different kinds of onions or tomatoes. Growing your garden from seed can be very rewarding and cost effective. After you are done planting, if you have seeds left, you can save those for next year. Simply put them in a bottle with a lid, and place in the back of a refrigerator. 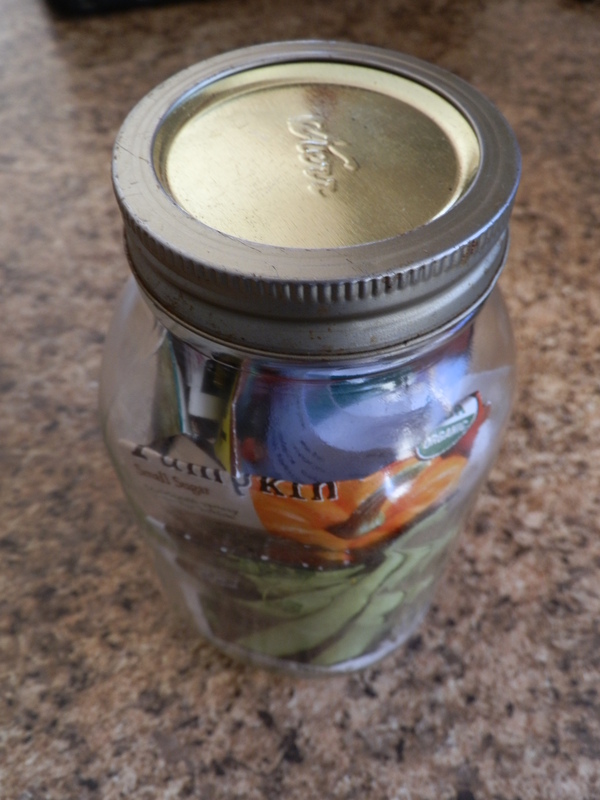 Keeping them sealed in a jar helps them keep the moisture they do have inside the seeds, and the refrigerator also helps them to stay cool and last longer. 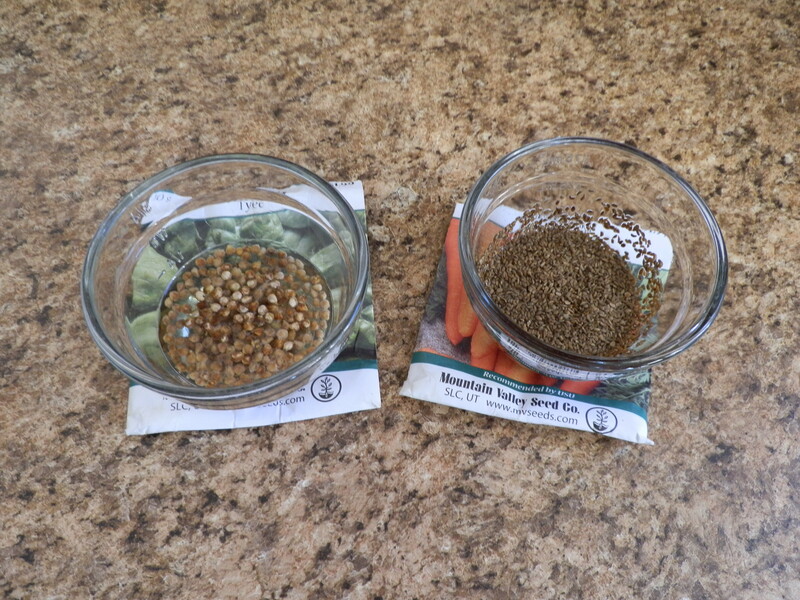 After you master starting your garden by seed, the next step would be learning how to harvest your own seeds and thus never having to even buy seeds! It is a great time to start selecting seeds to grow in your garden this coming spring. There are a few things you should think about when choosing which seeds will do the very best in your garden. First, you should find out how many average growing days are usual for your area. This can be done by looking up what the average first and last frost dates are in your area. For my area in the Salt Lake Valley, UT the last frost date in the spring is around May 10 or an easy way to remember is around Mother’s Day. The first frost of the season in fall occurs usually the first or second week in October. So we have around 145 average growing days give or take a week or two. This will make a difference especially for the warm veggies like tomatoes and squash. You want plenty of time to harvest from your garden. If you plant a vegetable that will start producing around the same time of the first frost in the fall that will really limit how much you will be able to harvest before the frost kills your plants. So when looking at seed catalogs or packets, there is a number that is for the days to maturity. Be sure to choose varieties that will work well with your growing season. Next to the plant name will have either OP or F1. OP means Open Pollinated. This means the offspring of these plants will be very similar to the parent plants. Heirloom varieties are considered open pollinated. You can save the seeds from these plants to plant in your garden the next year. F1 means there were 2 different but similar varieties bred together to get this variety. You wont want to save these seeds as they will be inferior to the parent plants. Remember to watch for specific qualities you want in the description. If it dose not tell you what you are looking for chances are they do not have that quality. For example a tomato that is good for sauce will say so. The description also usually tell you size, if it is disease resistant and any other special features it has. The following post is from a guest writer to my blog named Joe Lamp’l. Thanks Joe for the great advice! The EPA estimates that about 7.8 billion gallons of water – or anywhere from 30 to 70 percent depending on the region – are used outdoors in the U.S. each year. And as much as half of that is wasted due to inefficient watering methods. Today’s homeowners should know the methods that allow them to efficiently utilize their natural resources, which as a result saves them money on their utility bills and minimizes their time spent on upkeep. 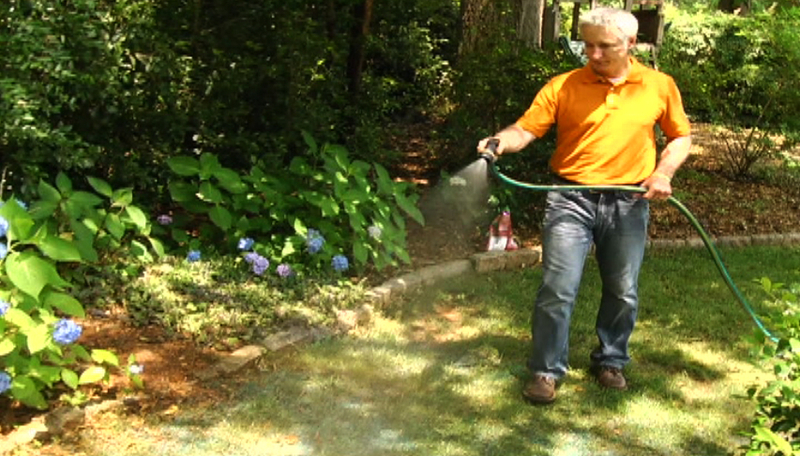 Ways to keep your lawn and garden healthy while minimizing outdoor water consumption and maintaining sustainability. As a Certified Landscape Professional and Master Gardener, Joe Lamp’l combines his television experience and expertise of landscaping, environmental stewardship and passion for living a more eco-friendly life, as creator, host and executive producer of the award-winning national public television series Growing a Greener World®. The show, which is entering its fourth season, focuses on the stories of people, places and organizations that are doing good things for the planet, with an emphasis on landscaping topics. He also serves as a landscaping and sustainability guest expert on national morning shows like NBC’s TODAY Show, ABC’s Good Morning America and The Weather Channel, among others. 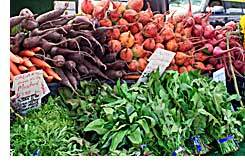 Why Should I Stagger Planting My Vegetables?